Chop the garlic cloves finely and soak in 1 tablespoon of olive oil. Add the diced tomatoes and let cook for at least 15 minutes, stirring from time to time. Saute the noodles in a separate pot until they brown a bit. Add the tomato and garlic mixture to this and combine well with the pasta. Now you can add the white wine and fish broth. Cook for 15 minutes and then add the clean mussels. Cover the pot and wait for the mussels to open completely, about 7 minutes. To save time you can use canned tomatoes to prepare the tomato and garlic mixture. To give the dish a touch of color and highlight the flavor, sprinkle chopped fresh parsley over the noodles. Planning your menu for Holy Week is quite a task, but it can also be very fun. It's at this moment that seafood becomes the star and your faced with the issue of finding the perfect dish to satisfy everyone. 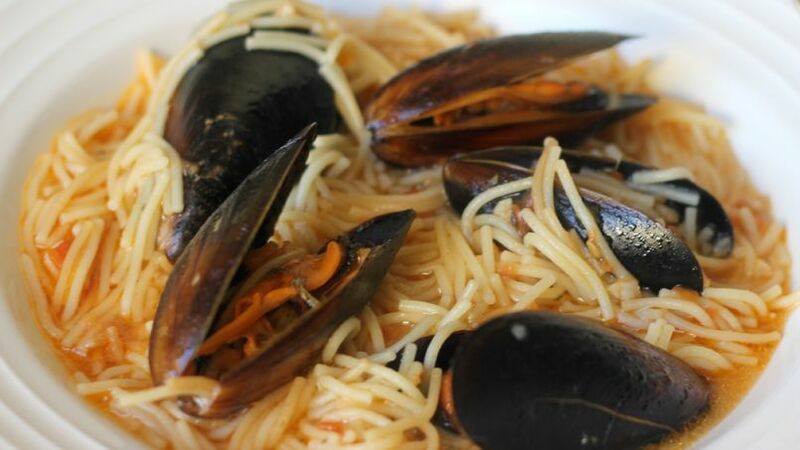 For example, how do you feel about mussels in noodles for Holy Thursday? Anyone that loves pasta is sure to like it, even the kids will be happy to see the tiny noodles drenched in a tasty sauce. You can serve this dish with freshly baked bread and fresh, chopped parsley.